Made famous by "Radar O'Rielly" in the television series "MASH". WWII-Korea war. Wonderfully accurate reproduction of the Boer War cotton tunic, as worn by the Australian contingents in the Boer War 1899-1902. These tunics have been produced with the correct three point pockets, standing collar, correct cuffs. We tailor make these to your size. Price includes tunic and trousers. We can tailor make any uniform to your measurements, including this example of a Royal Marines Redcoat uniform as worn by the First Fleet in 1788. Uniform includes white cotton shirt, white cotton trousers, long red jacket, black canvas gaiters, (all made to suit your measurements) leather straps holding ammo box and bayonet frog. 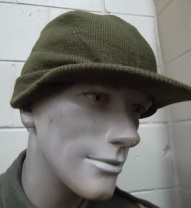 These are excellent reproductions of the WWI Brodie Helmet Liner. Perfect to re-build that WWI helmet. These are excellent reproductions of the WWII British/Australian Helmet Liner. Perfect to re-build that WWII British/Australian helmet. We can supply the full range of uniforms for all you needs from First Fleet marines, through to Zulu War, Boer War, WWI and WWII. All of our uniforms are tailor made to your measurements. In this photo we show the red tunic of the British pattern Zulu War era. Infantry with the 577/.450 cal. Martini Henry Rifle. Comprised of: adjustable waist belt with brass 24th Regiment of Foot Badge belt buckle, pair of cartridge box pouches, over the shoulder cross straps, leather bayonet frog and black leather pouch. Pith Helmet. Available in white or Khaki. One size fits all. Reproduction of the British pattern 03 tunic. Available in sizes 36", 38". 40", 42", 44", 46". These are available in left or right. Suit the US Garand Sniper rifle. We have both the M3 and the M7 Shoulder Holsters in stock. We have the M3 and the M7 US Shoulder Holsters in stock. These are very accurate reproductions of the British/Australian pattern, World War Two helmet chinstraps. Khaki webbing with spring inserts. For the Light Horsemen. This is the 03 pattern leather bayonet frog. Perfect for the Light Horse re-enactor or collector alike. These come in natural leather colour. Another great reproduction of the WWI Springfield Rifle Sling complete with correct brass fittings. This is a very good reproduction of the WWII Springfield Rifle Sling. Complete with correct painted steel fittings. Looks great on the rifle! Here's a reproduction sling for the Snider Enfield. These very well made slings really make a Snider look complete. Dark brown in colour. This is an authentic reproduction of the early WWI pattern rifle sling for the LE I and WWI No 1 MkIII. Correctly stamped and complete with leather tie. They really finish off the old SMLE. Beautifully made in quality brown leather. Holds the .577/450 martini rounds. Very acccurate reproduction, great for re-enactors or display. Museum quality. These are a superb reproduction of the Australian "D" shaped dixies used by our soldiers during WWI. These come complete with the cotton cover and will be great for the re-enactor or collector alike. These are great for the re-enactor or collector alike. Brand new, including the belt, shoulder straps, ammunition pouches, small pack, water bottle carrier, entrenching tool carrier, bayonet frog and helve holder. The quality of these is excellent. Great price! Nice reproduction of the US trench mirror. Fits onto the tip of any bayonet to allow the user to safely see around corners. Reproduction 1853 Socket Bayonet and Scabbard. A very tidy reproduction of a hard-to-get item. Here's a handy little item for the Lee Enfield enthusiast. This reproduction firing pin removal tool is essential in any range tool box. M1917/42 .45 cal revolver holster as issued to U.S. troops in WWI & WWII. Top quality russet brown leather construction with large U.S. embossed on holster front. Pre-WWI style .45 cal low slung gunfighter style dark brown leather holster with tie down strap. Set comes complete with adjustable belt and brass US belt buckle with matching double magazine leather pouch.